Writing can be a pretty solitary pursuit. I traditionally don't even share anything I'm working on until I've finished a full draft and done at least two rounds of revisions. That's a lot of late nights on my own, down in my basement office. I'm about to embark on round 2 of the revision process on books 4 and 5 (which will be released together when done). I still haven't shared them with anyone, but my writing time isn't quite so solo anymore. 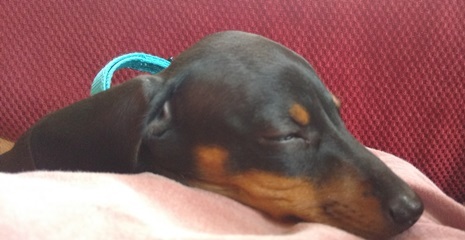 We got a dachshund puppy 3 weeks ago. Her name is Charcole, and she is such a sweetheart. At just over 5 pounds (and growing), she's a perfect lapdog. And since I'm the last one to bed, I'm usually the one to put her to bed, which means some nights she hangs out with me as I work. She's great company. I'll have to work her into the Acknowledgements when I'm ready to release.